Editors' Pick: Originally published Dec. 31. With just a single trading session left in 2015, the big S&P 500 index is on track to end the year more or less flat from a price standpoint. Today, the S&P is a mere 22 basis points higher than it started back in January -- barely enough to count as a rounding error. But that's not to say that investors managed to book breakeven performance. While the market averages are nearly unchanged, a big chunk of the individual stocks that make up those indices are deep in the red. As I write, a whopping 39% of S&P components are down 10% or more year-to-date. Put simply, it's been easy to own some "toxic" performance for your portfolio this year. And even more stocks are starting to show some cracks as we head into 2016. To stay a step ahead of the market this winter, we're turning to the charts for a technical look at five big-name stocks that are starting to look toxic. Up first is $13 billion industrial manufacturer Parker-Hannifin (PH - Get Report) . Toxic performance is nothing new for shares of this big manufacturer -- this stock has shed almost a quarter of its market value in 2015, plummeting over the course of the calendar year. The bad news for long-suffering shareholders is that Parker-Hannifin could have even further to fall thanks to a bearish price setup forming in shares. Parker-Hannifin has spent the last few months forming a descending triangle setup, a bearish continuation pattern that's formed by horizontal support down below shares (at $94 in this case), and downtrending resistance to the upside. Basically, as this stock bounces in between those two technically meaningful price levels, it's been getting squeezed closer and closer to a breakdown through support. 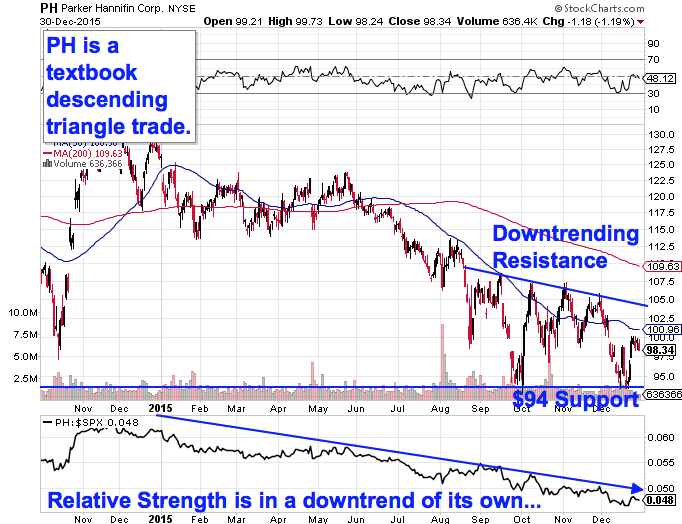 When that $94 price floor gets violated, a whole lot of downside risk opens up in Parker-Hannifin. Relative strength, which measures Parker-Hannifin's price performance versus the broad market, is an extra red flag to watch here. 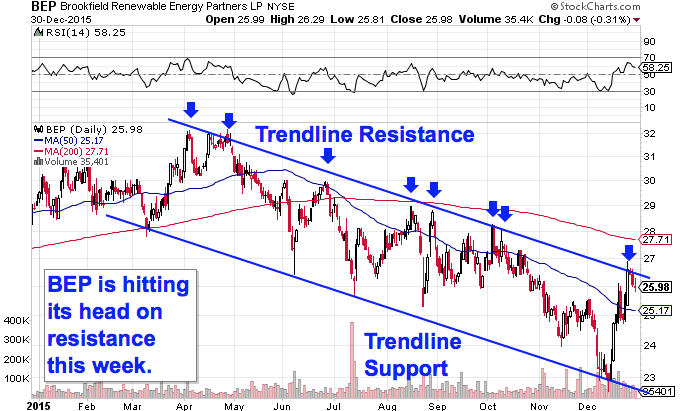 Our relative strength line is still holding onto its downtrend in December, which tells us that this stock is still underperforming the rest of the market in the long-term. If you own this stock right now, it makes sense to keep a very close eye on $94 support. We're seeing the exact same price setup in shares of mid-cap methanol producer Methanex (MEOH - Get Report) . Since the beginning of the fall, Methanex has been forming a descending triangle setup of its own. Support at $32.50 is the big price floor to watch out for in this stock. Why all of the significance at that $32.50 level? It all comes down to buyers and sellers. Price patterns, such as this descending triangle in Methanex, are a good quick way to identify what's going on in the price action, but they're not the actual reason a stock is tradable. Instead, the "why" comes down to basic supply and demand for Methanex's shares. The $32.50 support level is a price where there has been an excess of demand for shares; in other words, it's a spot where buyers have previously been more eager to step in and buy than sellers are to take gains. That's what makes a breakdown below $32.50 so significant -- the move would mean that sellers are finally strong enough to absorb all of the excess demand at that price level. If $32.50 gets violated, look out below. You don't need to be an expert technical trader to figure out what's been going on in shares of $32 billion communications technology firm Ericsson (ERIC - Get Report) . Instead, the price action in this large-cap Swedish tech stock is about as simple as it gets. 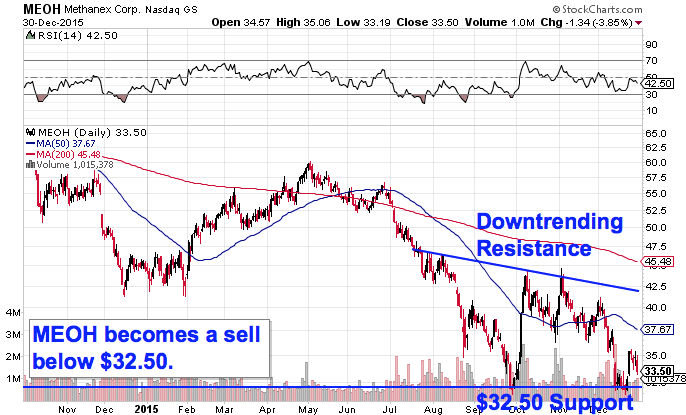 Ericsson has been bouncing its way lower in a well-defined downtrend for most of 2015. From here, it makes sense to sell the next bounce lower. Ericsson's downtrending channel is formed by a pair of parallel trend lines that identify the high-probability range for shares of this stock to remain stuck within. Every test of the top of this stock's price channel has been a great selling opportunity so far, and that makes any near-term move higher in this stock look suspect. Shares are testing that long-term price ceiling this week. Don't get thrown off by the abundance of gaps on Ericsson's chart right now. Those gaps, called suspension gaps, are caused by overnight trading on the Stockholm Stock Exchange. They can be ignored for trading purposes. Brookfield Renewable Energy Partners (BEP - Get Report) is showing traders the exact same price setup right now. Like Ericsson, this $3.7 billion renewable power stock has been selling off all year long, down 16% since the calendar flipped to January. And as shares test the top of their trend channel for an eighth time here, it makes sense to sell this bounce lower. Waiting for that bounce lower before clicking "sell" is a critical part of risk management for two big reasons: it's the spot where prices are the highest within the channel, and alternatively it's the spot where contrarians will get the first indication that the downtrend is ending. Remember, all trend lines do eventually break, but by actually waiting for the bounce to happen first, you're confirming that sellers are still in control before you unload shares of Brookfield Renewable Energy Partners. 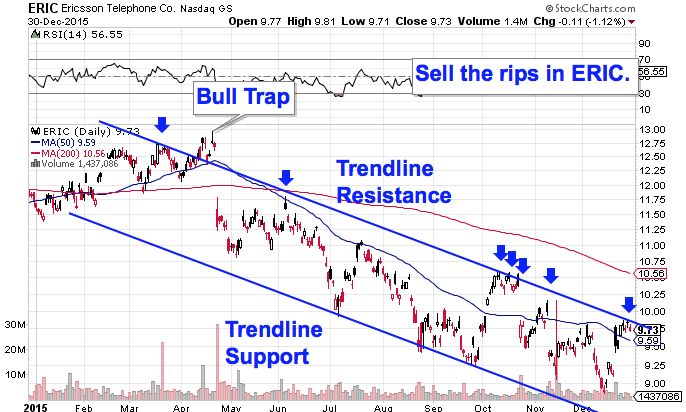 Shares have been correcting ever since last week's touch of our trend line resistance level. That's enough of a bounce to treat BEP like it's setting off on its next leg down. Don't get left holding the bag while shares search out their next support level. Last up on our list of potentially toxic stocks is Allergan (AGN - Get Report) , the $124 billion pharma firm that's being acquired by Pfizer (PFE - Get Report) in a deal worth approximately $363 per share. It might sound strange to call a buyout target toxic for your returns -- particularly one that's trading at a discount to its deal value. But a large component of this deal comes from Pfizer's own stock price, which means that shares are still being impacted by market conditions. Likewise, there are also some long-term hurdles that this company needs to clear before shareholders can collect their payout. While they wait, Allergan's near-term price action is looking "toppy" this winter. Allergan is currently forming a textbook head and shoulders top, a bearish reversal pattern that indicates exhaustion among buyers. The head and shoulders pattern is formed by two swing highs that top out at approximately the same level (the shoulders), separated by a higher high (the head). 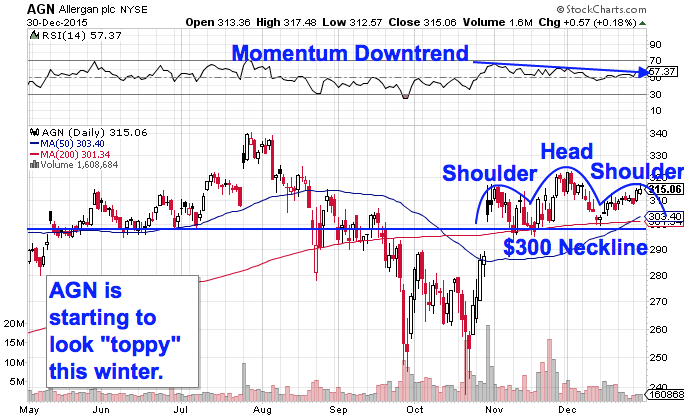 The sell signal comes on a move through Allergan's neckline, which is at the $300 price level. Like with any technical trade, it's important to actually wait for Allergan to violate $300 before trying to unload it. While the price pattern and downtrending momentum are certainly red flags, sellers aren't in control until shares fail to hold $300 support.